Hey there you contemporary lighting lovers! There are so many different yet beautiful lighting designs you can choose from, and we know sometimes it can be hard to decide which one you like the most for your home design. For that reason, we at Contemporary Lighting selected the best 10 circular pendants for you! So here is our first suggestion for you! Doesn´t it remind of jazz music?! Well, you guys know around here we are big music lovers and showing you some lighting designs that contain this passion of ours is always a top priority! So this next one is pretty similar to the one we presented before but you will love it anyway! DelightFULL, Botti pendant lamp emanates music and rhythm to any space! 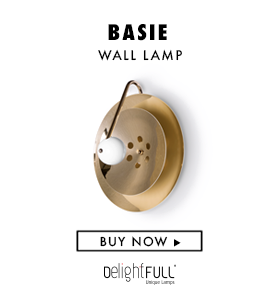 It´s also a piece that will literally light up any space! This next lamp is definitely unique. This piece of lighting is inspired in part by the big afro hair styles that popularized the 60s, Kravitz Suspension but is also a tribute to the bold, multiple awards winning rock star, Lenny Kravitz. A series of tubes in a circular pattern trimmed to be shaped like a ball make this a funky modern-looking centerpiece to hang over a great table or decorate the center of a room. Boca do Lobos´s Newton suspension lamp is indeed an exquisite chandelier! If you look close enough you can see that each circle has designed the pattern of a cut tree and everything is hand made! Shakuff, Exotic Glass Lighting and Decor. Suspension lighting is the perfect contemporary lighting option for every kind of house, apartment, hotel, restaurant, bar and to every corner of it. Black table, yellow and white woven chairs, white bench with a grey cushion, printed yellow, black and white throw pillows, grey curtains, and circular light fixture. Iconic Verner Panton Lacquered steel flowerpot pendant lamp which has been reinvented with the fashionable copper metal finish. Originally designed in the late 1960s in the same year that Stanley Kubrick featured the future of 2001 using Panton’s iconic chair, the original version of this colorful lamp was hanging in bars and restaurants and soon homes around Europe. The flower pot with its 2 semi-circular spheres facing each other has proved its lasting design quality and is just as stylish. This next lamp looks pretty awesome right?! It´s like little disks on top of each other and it just looks really original. Do you love a cool and edgy environment? Well, Giopato & Coombes, Bolle Lamp is the answer for you! It look great and since it´s all made in glass the lighting shedding from this lamp should create a pretty cool room! Koket, hypnotic modern pendant it´s a feminine luxurious touch to your home! It has a unique design and it´s a unique piece to add to ones home.